Hackathons are innovation challenges for skilled developers. 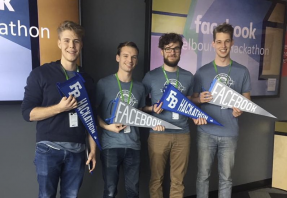 Earlier this year (06/05 to 07/05), Nathan Malishev, Josh Parnham, Daniel Sykes-Turner, and Hugo Müller-Downing attended the Facebook Melbourne Hackathon. Enabling end users to react to any web page with emoji. They effectively built an engaging product for two demographics: end users, and website owners who might want to gauge reactions to their sites and pages. The idea was to take what Facebook has done with their reactions (https://newsroom.fb.com/news/2016/02/reactions-now-available-globally/) but allow anyone to react to any website. The embedded version is similar to Disqus' comments or the Facebook 👍 button; you embed it and anyone who visits your site can use it. The Chrome extension adds this functionality to all websites you visit and allows you to react to them by simply hovering over the reaction bar. Our team, 'Moji', took home first prize — a trip to San Francisco to compete in the Facebook Global Hackathon finals. This is a real achievement. The finals have narrowed a global participant pool in the tens of thousands down to the elite 12-14 teams. They will on 16th November, in Menlo park, enter a 24 hour world class hackathon. Localz values this talented and clever team. They keep Localz technology at the cutting edge. Localz provides solutions that transform the last mile of deliveries in logistics, retail and utility businesses. Solutions that enable businesses to thrive in the individual economy - Iconomy. Supporting services and products to deliver first time, where and when the consumer demands. Experts in location technology and customer data we help businesses to improve their last mile of delivery. Enabling real-time changes in delivery details; meeting the consumer demands for transparency and making fulfillment management seamless. Localz is working with Woolworths, DPD and British Gas.